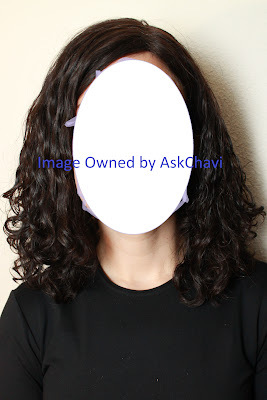 I started AskChavi to help wig-wearers share their experience with their wigs and offer them a forum to review them open and honestly. I am always happy to share a review from one of my readers and I encourage you to contact me if you want to review one of your wigs. With so many sheitel-machers & wig companies on the market today its hard to determine who to buy from. For many readers the problem is where to buy a wig, because if one lives outside of New York, Israel, Los Angeles and other populations with large orthodox Jewish communities there may not be many or any local wig sellers to buy a wig from. One option that is popular with readers living in more remote communities is to order online. However, ordering online can be a stressful and difficult situation, being that a wig is such a personalized product and buying something with such a high price tag sight-unseen is a scary proposition. However, there are many caring wig-sellers who cater to the online market with welcoming return policies and personalized customer service over the phone, striving to find out what the customer wants before sending out wigs for them to try. I have found Savvy Sheitels to be a caring provider of wigs to their customers and they have a very customer-friendly return policy that makes it possible to find a wig over the Internet. One of my readers wanted to share their experience with their purchase of a wig from Savvy Sheitels. She had always wanted a curly sheitel since her natural hair is curly. Thanks to the affordable pricing of this particular sheitel she was able to achieve the desired look. Below is her thorough review. Based on what I found on their website, prices seem to range from $300-$3500 depending on length, hair type & quality. 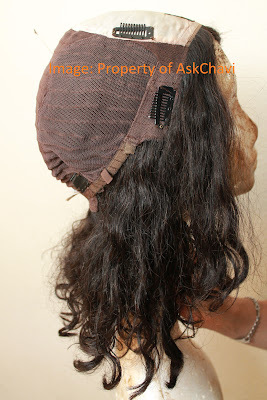 Cap Type: Machine made stretch cap with closed wefts with movable "skin top"
Weight/comfort: A with WiGrip, A- with clips. The wig feels quite light, despite having thick hair. The included clips were slightly pulling at my hair (this may be due to my having a large head and thick hair) but I recently switched to a WiGrip band and that solved the problem... sometimes, I even forget that I'm wearing a wig and not a tichel! Hair Quality: A-. The hair itself is a very good quality--strong, maintaining its curl and virtually no split ends after almost 8-months of near daily use. The sheitel needs gel and mousse to maintain its curls (which is true of all curly hair sheitels, and even curly hair that grows straight out of your head!) and I love that I can "reset" my wig just by scrunching in a bit of mousse -- so much easier (and cheaper!) than needing a wash and set! I periodically add a small dab of BioSilk to the underside of the sheitel, to deter matting. Underside matting is common with curly sheitels so I chalk that up to standard maintenance. The hair color was originally a #2, and in my opinion it is oxidizing a bit faster than typical for this shade -- my other #2 sheitels took a full year to oxidize to the same color. (To be fair, I live in a sunny region where oxidation is a common problem with sheitels.) I do not think that the early oxidation will lead me to dye it any sooner than I dyed my previous sheitels so it isn't a big concern. Skin top: A. The skin top extends far back on the head, allowing me to part the sheitel how I parted my own hair back in the proverbial day. The skintop included some precut baby hairs (with other sheitel machers charge extra for) which add to the realistic hairline. Durability: A-/A. After 8-months of regular weekday use, the sheitel still looks and feels like it did out of the box. I am a bit hesitant to give a full "A" because of the minor oxidation issue mentioned above, but I'm also a bit hesitant to go all the way down to "A-" because someone who lived in a less sunny region might not share this specific concern. Appearance: A. The sheitel looks great, and I finally feel like I look like myself" for the first time in over six years! Cap Construction: A. The sheitel has a solid stretch cap that has not yet developed any holes. It included a front hairline comb, two clips on the crown (I have no idea what those are for), two clips on the ear tabs, and two clips in back that could hold the sheitel in place for an up-do or pony tail. Overall: A all the way! Ironically, this sheitel is the wig that has finally, after six+ years of hair covering, turned me into a tichel wearer... I don't want to wear the sheitel every day because I want to make sure that it lasts for as long as possible! I can't imagine that I will ever again find a sheitel that matches MY curls so perfectly. Does the cap fit you well, is it comfortable? I have an XL-sized head and very thick hair, and was a bit hesitant to purchase a wig with "only" an L-sized cap. However, I wasn't about to pass up the chance to reclaim my curls and I am so glad that I took the risk! The cap is much larger and more comfortable than the XL-wig that I purchased from a different manufacturer. I would definitely recommend the Aura L and XL cap to anyone else with a large head. Does it give you headaches? The sheitel never gave me a headache. My hair did pull a bit from the clips (this is probably due to my having a large head and very thick hair under the sheitel) and switching to a WiGrip cleared that right up. Does the hair knot? It is normal for curly sheitels to get matted in back, and this wig is no exception. Rubbing a tiny amount of BioSilk into the hair helps to keep matting at bay. I do not find that the rest of the hair knots any more than my "real" hair did, so I don't have any complaints... of course, I never tried brushing the wig myself because brushing a curly sheitel will be its set's kiss of death. Do you think the skin top is realistic? The skin top is (in my opinion) very realistic, especially with the included baby's hair. Have you ever washed it yourself? Yes, I almost always wash my sheitels myself. Admittedly, I tend to just add more mousse/gel whenever the sheitel isn't looking so fresh, though, so I think I've only washed it once. How long did it take to arrive? The wig was premade and shipped as soon as Chira received my payment. How was the customer service? Excellent! Chira was very patient answering my (many!) questions when I deliberated over whether or not to make the purchase and sent me several detailed photos of both the sheitel and its cap. When I had trouble with matting (a common problem for curly sheitels) Chira advised me on how to safely remedy the problem with BioSilk. Would you order from them again? Yes! I have an extraordinarily difficult time finding sheitels that fit me comfortably, and the Aura's L-sized cap, combined with the sheitel's excellent hair quality and sturdy build, definitely won me over to their side! Did you get what you expected in terms of quality? Overall, I got more than I expected in terms of quality. The sheitel's extraordinary durability and hair quality--both much, much better than I expected for the price--more than compensate for the slightly early oxidation.